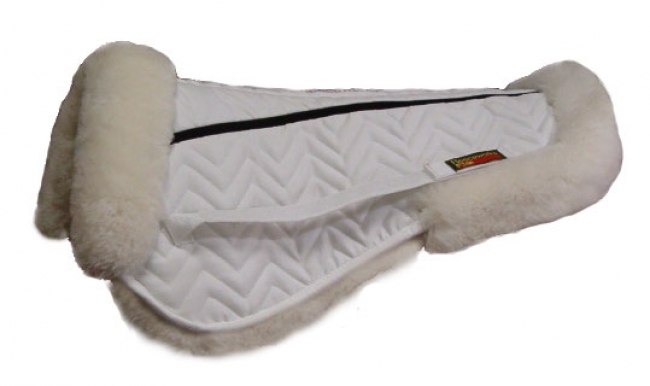 Fleeceworks Classic Halfpad with the FWXK Technology adds a protective layer between your horse and the saddle. The FWXK halfpad fits neatly underneath dressage, close contact and all purpose saddles. It can be worn by itself, over or under a thin square pad. This halfpad features Fleeceworks FWXK Technology for comprehensive wither and back protection. Cross elastic panels along topline absorb pull and eliminate pressure on spine and withers. Ultra-luxe Merino sheepskin with ideal bulk/benefit ratio delivers the best in heat and moisture management and overall relief from pressure points. Rolled sheepskin edges give a fashionable look.